Muahahahahahahaha! GIF Party Time! As some extra Winter Season hype, I thought we could have a bit of fun with some Winter anime GIFs! Bring it on! And don't forget... Everybody! Put your hands up! 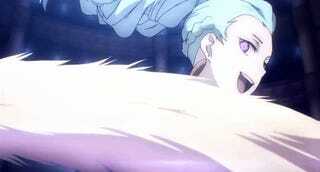 Header from Death Parade, a.k.a. the please Protonstorm stop talking about this show show. There's been a new podcast episode released! Just because we love you all so much, there is also now an Otaku's Guide to Life put together in case you have a life and need a guide (duh!) and Goose. House. Everywhere! Also, Fatalis gave us an in-depth look at his thoughts on anime, which you should give a read as well. Last but not least, we had a two person review of Patema Inverted by Dexomega and Rockmandash12. Due to recent issues with the organization of the claimation (totally a word) of reviews, I think it is important to give this a read. We apologize for any stress this error may have caused you.